We think fascia is beautiful. And because fascia is the thing that gives your body form and shape - we think you’re beautiful too. What we also know is that ‘life’ (think sports, injuries or just too much time at a laptop) can get in the way of a healthy, flexible, pain free body. So we created a system so simple anyone can do it, so small you can take it anywhere, and so effective you become addicted at the first roll. This is Roll & Release, a method of deep-tissue, fascially focused self-massage that eases and eliminates pain, dramatically increases flexibility, and leaves your whole body feeling completely delicious. The practice of rolling on balls, or blocks, or rocks - or whatever you can get your back into - has been around for decades. What sets this practice apart is its systematic use of the Myofascial Meridians to deeply calm the central nervous system. Born at Radiantly Alive in Ubud, Bali, it was developed specifically for yogis. Soon word spread and classes started filling with surfers, weightlifters, mums, martial artists and even second cousins twice removed. We realised that they all had two things in common; a love of Roll & Release and wanting to learn more. We listened. Below you will find a series of simple, beautiful and effective online courses. Whether you want to deepen your own practice, learn the anatomy of fascia, or teach Roll & Release to other people, there’s an option for you below. Have a studio? Interested in a bulk order or consignment? Contact us here. James is a teacher, facilitator and coach, dedicated to finding the most effective and enjoyable ways to create lasting change in the mind and body. 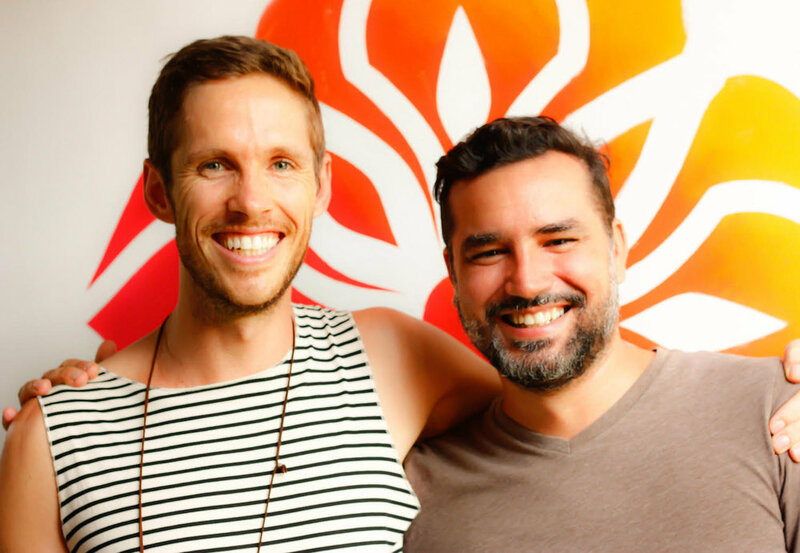 Rafael is a business owner, entrepreneur and husband who owns the stunning Radiantly Alive Yoga Studio in Ubud, Bali - where Roll & Release was born. Together (alongside our amazing support staff) they create the team of Roll & Release which is committed to helping you help your body.